So, you want to do your part to help the environment? You would like to eliminate some CO2 from the air? There are hi-tech solutions on the horizon like CO2 capture and storage. But these are theoretical and off in the future. There is a simpler way today that you can get rid of CO2 in the air. You can buy some CO2, today. Actually you won’t be buying CO2. You will be stopping CO2 from entering the atmosphere. Much of New Hampshire’s electricity is being made by burning fossil fuel. Every kilowatt hour (kWh) of fossil fuel generated electricity purchased by a NH utility, releases 1.39lbs of CO2 into the air. That same energy produced by solar PV, releases 0 lbs. of CO2. We have put a price of .89 to get you interested, but that amount buys you way more than one pound. The cost to eliminate one pound of CO2 is more like five cents! Over the life of a solar array, your nickel will eliminate 1lb of CO2 from the air because your donation will go directly to building NH Solar Shares’ PV arrays. How about buying some CO2? Every dollar donated goes directly to build the array. $0.0597/kWh / 1.39lbs/kWh = $0.043/lb. 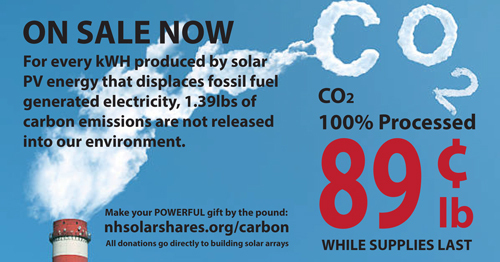 Footnote: In addition to eliminating CO2 from the atmosphere, by donating to NH Solar Shares you are also helping families who need assistance with paying their electric bills. And you’re helping to increase the amount of clean renewable energy feeding our local electricity grid.